Shortly after Edwin H. Armstrong demonstrated the viability of FM (frequency modulation) for long distance broadcasting in January of 1940, the U.S. FCC (Federal Communications Commission) allocated spectrum to it in the 42-50 MHz band. Armstrong had introduced the FCC to FM originally in 1936. The new modulation scheme was popular due to its immunity to amplitude related noise like that generated by motors, automobile ignition systems, and lightning. 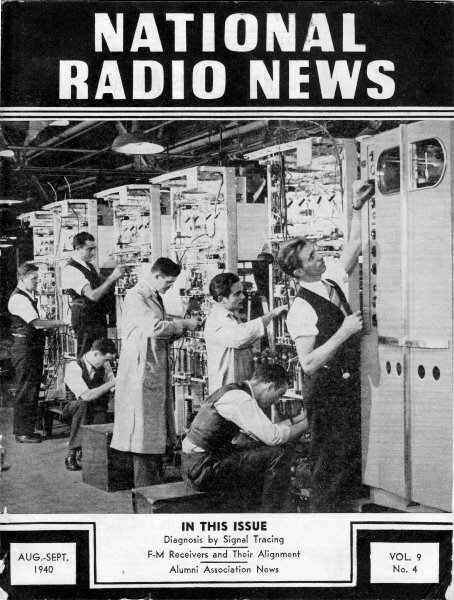 However, World War II broke out a little over a year later and most commercial radio advancements were put on hold. This article from a 1940 edition of National Radio News could not have predicted that, or the FCC's decision to relocate the FM spectrum to 88-108 MHz in 1945 in the closing days of WWII. Some speculate that the spectrum shift was a ploy by RCA chairman David Sarnoff to undermine the advantage Armstrong had with his established FM radio production. Nah, it couldn't be so because government bureaucrats have never done favors for the benefit of friends/acquaintances for political favor or wealth. Hailing frequency modulation as "one of the most significant" contributions to radio in recent years and declaring that f-m broadcasting on a commercial basis is desirable in the public interest, the Federal Communications Commission recently announced the availability of the frequency band of 42,000 to 50,000 kilocycles for that purpose. This will provide 40 f-m channels, each 200 kilocycles wide - 35 to regular high-frequency broadcast stations and 5 to noncommercial educational broadcast stations. "Frequency modulation is highly developed," declares the Commission in unanimous report. "It is ready to move forward on a broad scale and on a full commercial basis. On this point there is complete agreement among the engineers of both the manufacturing and the broadcasting industries. A substantial demand for f-m transmitting stations for full operation exists today. A comparable public demand for receiving sets is predicted. It can be expected, therefore, that this advancement in the broadcast an will create employment for thousands of person in the manufacturing, installation and maintenance of transmitting and receiving equipment and the programming of such stations." At the same time the Commission points out that there was agreement among witnesses at its recent hearing that this new service will not supplant the service of standard broadcast stations generally and that, therefore. f-m will not make obsolete the receiver now in use. Standard broadcasting is on an entirely different frequency band from that to be occupied by frequency modulation. F-m will not interfere with it. Present standard broadcasting will continue, and certainly for a number of years will render full service. The extent to which in future years the listeners will be attracted away from the standard band cannot be predicted. Testimony at the hearing indicated that manufacturers will provide receiving sets capable of receiving both services. The chief claims for f-m are that it gives more fidelity and less interference than standard broadcast. The principle of frequency modulation has long been known but it practical use was not demonstrated until recently. There was unanimous agreement at the March hearing that f-m is superior to amplitude modulation for broadcasting on frequencies above 25,000 kilocycles. The use of a wide band of frequencies makes possible a reduction of noise to a greater extent than attained with narrow-band standard broadcast. There was testimony that a band width of less than 200 kilocycles can be used for f-m, but this lessens the noise-discriminating quality which has been established by experimental operation with the wide channel. Testimony advocating the narrower band width was not supported by experience in program service. Moreover, the narrower band width would jeopardize use of facsimile transmission on the same channel. The Commission believes that regular program service should begin on a 200-kilocycle band basis which can be conveniently reduced if developments warrant. By adopting the wide-band f-m channels at this time, it will be possible for the public to continue the use of receivers designed for wide-band reception even though narrower channels may later be authorized. The opening of a new band for commercial broadcast will help to correct numerous defects and inequalities now existing in the standard broadcast system. These inequalities result from the scarcity of frequencies, their technical characteristics, and the early growth of broadcasting without technical regulation. There is today a lack of stations in some communities, and other communities do not have sufficient choice of program service. The establishment of the new broadcast band in the higher frequencies will enable many communities to have their own broadcast stations. Experimental operations show that f-m stations can operate on the same channel without objectionable interference with much less mileage than is possible with standard broadcast stations. F-m has the ability to exclude all except the strongest signal Also, f-m stations require much less mileage separation than do standard broadcast stations. The service range of f-m stations, though limited, will in many cases be greater than obtained from the primary service of comparable standard broadcast stations. The licensing of classes of standard broadcast stations in the same area with different frequencies and different power has resulted in a wide disparity in the extent of service to the public. The system of classification now employed for standard broadcast stations will not be used for f-m stations. The rules and regulations and engineering standards to be issued for f-m in the near future will enable applications to be made for facilities to serve a specified area. F-m stations will be rated on the basis of coverage rather than power. Competitive stations in the same center of population will be licensed to serve the same area. The present situation of certain standard broadcast stations having large daytime coverage and restricted nighttime coverage on duplicated channels will be avoided. The coverage of f-m stations will be substantially the same both day and night. However, f-m stations do not have the long-distance coverage of the present high-powered clear-channel standard broadcast stations. The latter may be required indefinitely, for widespread rural coverage, But for covering centers of population and trade areas, the new class of station offers a distinct improvement. The Commission deems it in the public interest to allocate a contiguous band of frequencies to accommodate both commercial and educational f-m stations. The band between 42,000 and 50,000 kilocycles is particularly suited for this service. Under the new allocation, the same number of frequencies heretofore assigned to non-commercial educational stations has been retained, the only change being that the position of such stations has been moved 1,000 kilocycles higher in the spectrum. This arrangement permits the same receiver to be used for the two services. The three educational institutions now authorized to use amplitude modulation in the non-commercial band can continue to do so, but the Commission hopes that subsequent applicants for non-commercial educational broadcast facilities will find it economic and otherwise preferable to utilize f-m.
Readjustment of the ultra-high radio frequencies to provide the 40 f-m channels between 40,000 and 50,000 kilocycles, as well as seven channels below 108,000 kilocycles for television service, is pursuant to allocations contained in Commission Order No. 67. The solution to finding space in the crowded radio spectrum for the needs of these two services was achieved with the cooperation of the Interdepartment Radio Advisory Committee in Shifting Government frequencies. This committee, representing 13 Federal agencies, advises the President in allocating radio channels for Government use. The arrangement gives private services priority rights between 60,000 and 66,000 kilocycles and between 118,000 and 119,000 kilocycles in exchange for relinquishment to the Government of the bands 41,000 to 42,000 kilocycles and 132,000 to 140,000 kilocycles. In addition, the Commission discontinued television service in the present television channels Nos. 1 and 8 (44,000-50,000 kilocycles and 156,000-162,000 kilocycles respectively). Accordingly, old television channel No.2 will be renumbered television Channel No.1; and a new television channel No.2 will be assigned from 60,000 to 66,000 kilocycles. Former television channel No. 8 (156,000-162,000 kilocycles), together with frequencies between 116,000 and 119,000 kilocycles, will be used to replace the assignments in the band 132,000 to 140,000 kilocycles. There is no change in the other eleven channels comprising the 162,000 to 300,000 television band. The new allocations become effective immediately on a limited basis. After January 1, unlimited operation may be authorized. Regular commercial service employing wide-band f-m, which may include the multiplexing of facsimile transmission simultaneously with aural broadcasting, will use the 43,000 to 50,000 kilocycle band, and non-commercial educational broadcasting stations are given the new frequencies 42,100, 42,300, 42,500, 42,700 and 42,900 kilocycles. This provides a continuous band for f-m, thus assuring a degree of uniformity in the quality of the different frequency modulation channels and tending toward simplicity and economy of f-m receiving sets. The rearrangement permits the Commission to maintain seven television channels below 108,000 kilocycles and at the same time provide an adequate number of channels for frequency modulation. It expects these and other services to benefit by the changes. It points out that sky wave interference on frequencies immediately below 50,000 kilocycles is greater than on the higher frequencies. While it likewise recognizes that shadows and fading become more pronounced as the frequency increases, it nevertheless believes that such factors are not substantially different on frequencies in the vicinity of 60,000 kilocycles. Furthermore, it is generally conceded that the problem of diathermy interference is now most acute on frequencies immediately below 50,000 kilocycles. Thus, by allocating 60,000 to 66,000 kilocycles instead of 44,000 to 50,000 kilocycles to the television service, a good balance has been achieved between the effects of sky wave and diathermy interference on the lower frequencies and the effects of shadows and fading on the higher bands. The miscellaneous radio services now assigned frequencies between 132,000 and 140,000 kilocycles will benefit by the changes in that 9,000 kilocycles are now allocated where formerly only 8,000 kilocycles were available. This can provide 70 channels as compared with 57 channels in the past. The change has the further advantage of providing two large blocks of frequencies for experimentation with different propagation characteristics.